We make the luxury custom home building experience transparent and communicate with our clients every step of the way, helping them make confident, educated decisions that shape their dream homes. As the premier luxury custom home builder on Florida’s Gulf Coast, we believe that we must differentiate ourselves to be a true market leader and create value for our clients. 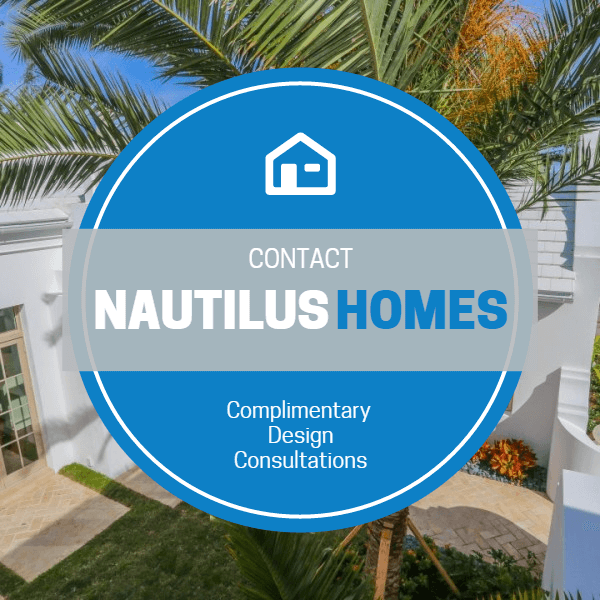 So, what makes Nautilus Homes different from other custom home builders or design build firms? We have a passion for perfection and for exceeding your expectations. 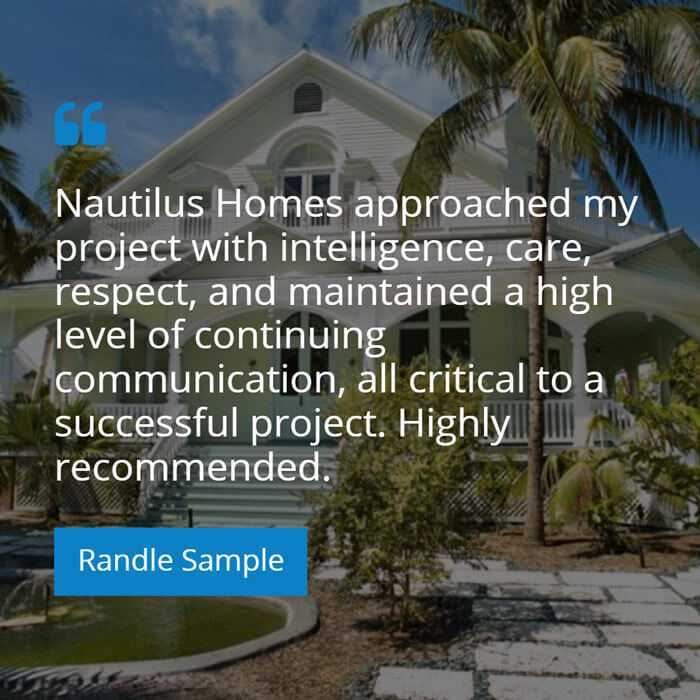 When you work with Nautilus Homes, you have full access to a dedicated team of experts who help you make the thousands of decisions that are important to you. Our mission is for you to enjoy your home building experience as much as you enjoy the final product. We work with the top architects in Sarasota and the surrounding areas to ensure your vision takes shape exactly as you envisioned it. The earlier we are able to get involved with your project, the smoother the process will be. When an architect and a custom home builder like Nautilus Homes team up early, we can sit at the same table and develop the vision and design for your dream home together, while keeping your budget in mind and working towards the same goals. One of the aspects we enjoy most about what we do is the ability to build a team around each project. We know that the most successful new homes or remodels are the result of a complete collaborative effort between trusted partners. That’s why we only work with the top local professionals in the industry who have the experience and expertise necessary to add value to all of our projects and a best-in-class experience for our clientele. Knowing the style, character and rates of each of these firms allows us to make the right recommendation to get our clients started on the right foot. If you are already working with an architect, we will bring those same fresh ideas, efficient construction techniques, architectural savvy and understanding of costs to the table during the design development. We value the opportunity to work with like-minded homeowners and professionals dedicated to designing and building beautiful homes and delightful client relationships. Contact us to better understand what makes us the right choice for a relationship that lasts a lifetime. In the typical design build model, homeowners and buyers will solicit an architectural firm to draw up the plans for a custom home project. When the plans have been completed, the architect will assist the owners in securing several bids from reputable home builders in the immediate or surrounding areas. Once the owner, the architect firm and the home builder are joined together, it’s normally common for the process to go back forth until the entire process is fragmented. As a result, the owner usually becomes frustrated with both the loss of time and money involved in this venture. Consistent with the typical design build model, our team of custom home builders is focused on facilitating a collaborative design build process. With alliances that include many of the top architectural firms in the Sarasota County area, we work together to bring your vision to reality and within your budget. Our clients can appreciate this unique alliance because they have their choice of architectural firms, according to their own style. For home designers and architects who share this vision, feel free to contact us about working on future projects together, especially since we are always looking for better ways to share our passion, rise to new challenges and expand our networks. Even though we are focused on cultivating long-lasting relationships with like-minded professionals and homeowners in the Sarasota area, we are also committed to building beautiful homes and luxury residences. As supporters of the Center for Architecture Sarasota, Nautilus Homes is proud to share in the rich architectural history of our area. The Center for Architecture Sarasota is a not-for-profit 501(c)(3) dedicated to celebrating the built environment while helping to shape the future of the profession through education. Through the connections that we have made at the Center, as well as other events and organizations throughout Southwest Florida, we are able to continually educate ourselves on home design, the built environment, and how what we do impacts our beautiful region. By gaining a deeper understanding of our diverse architectural past, we are inspired to create innovative designs that are both contemporary in aesthetic and respectful to the local traditions and landscapes. What Does a Sarasota Architect Do? Before a homeowner hires an architect for their job, there are some things they will need to know. One of the most important is not all architecture firms are created equal. Though many of these firms may possess all the same licensing and credentials, they may only specialize in one particular type of home or building. This means it is important for homeowners to interview these firms in advance to find the best fit. Because all architect firms possess the ability to draw up custom designs for a home and deliver them to a homeowner, people can expect the basic requirements to be met in every firm. However, each firm does have their own style, and they can differ greatly from one to another. So, when a homeowner is looking to hire an architect for their project, they should look for a firm that can offer the style in which they want to operate. To find out this and other related information, homeowners can review the firm’s portfolio to see what kind of projects they have already done. Part of this process will also involve getting a list of references from the residents in the area. Additionally, the homeowner should also request sample contracts that list fees along with their change order policies. This is a very important factor, because the initial pricing may be just what the homeowner is looking for. However, if the owner asks for add-ons, they may easily go over the homeowner’s established budget. What is the Specified Fee Schedule? How are fees determined and what services do they cover? Will probable construction cost estimates be provided? Are the fees for other consultants included in the total estimate provided (i.e. testing and inspection, civil, geotechnical etc.).? Permits and other government fees are attached to home building projects. Is the time spent in obtaining the necessary paperwork included in the initial cost or is this extra? How are additional services and reimbursement fees established? When changes are made, are additional charges added by government agencies and the building department? When the homeowner requests changes, how are those cost computed? When a homeowner is dealing with a reputable firm, the firm’s representative will not only answer the questions above in a fashion that the homeowner understands, but will also provide the responses in writing. It is also important to note that the initial quote provided may increase by as much as 20% on the average, especially because of the back and forth communication (different change orders) that goes on between the architect and the builder. Therefore, it is essential that the homeowner does their own homework before signing a contract. Our collaborative design model saves both time and money by bringing all parties involved in the project together through the entire process – from conception to completion. This allows the entire team to adhere to the needs, budget and final product exactly as envisioned by the homeowner. Since all the necessary pieces are in one central place, there are rarely delays and projects are completed on time. Our customers have come to love our design and build concept – especially because they are not required to work with a diversity of professional players during the span of the project (i.e. architects, engineers, builders, surveyors and other contractors). 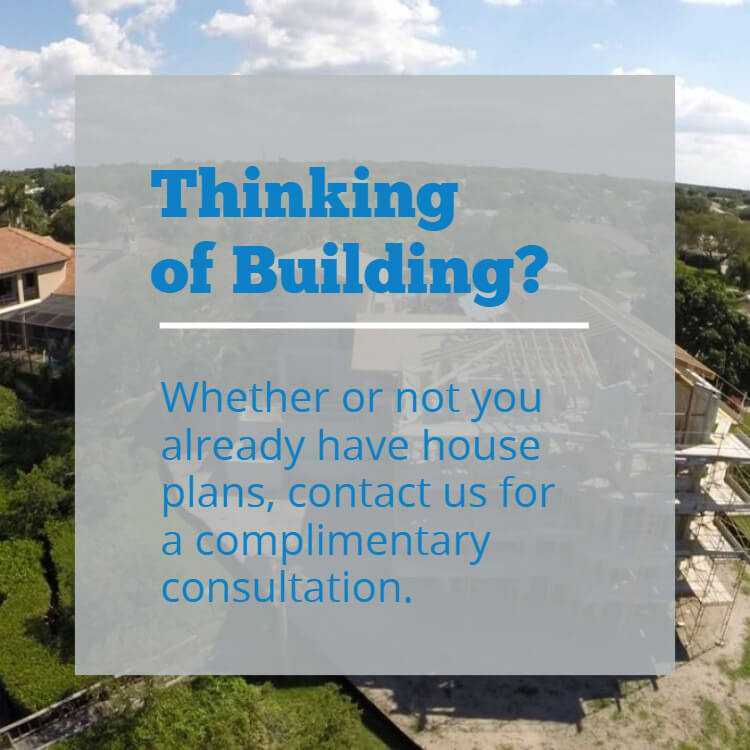 If you are thinking about making renovations to an existing home or building a home from the ground floor, let’s have a conversation. We specialize in educating homeowners in advance, so they know their options and feel comfortable with an end-to-end building concept that will save time and money.